Daina Kiela of Smile Politely visited our Twin City Derby Girls tryouts. Check out her story here. It’s funny but, when I left, I felt a tinge of regret for not trying out for the team. If you are female, at least 18 years old, willing to learn basic skating skills, and possess a “can-do derby” attitude, I highly encourage you to try out for the Twin City Derby Girls team next season. Even if you don’t feel comfortable on wheels, league volunteers and supporters at bouts are most welcome. Alter Egos on the Road! The Alter Egos have been busy this season!! They started the year with a win over the McLean County Missfits 131-129, and then headed up to Kalamazoo to do extra duty filling out the B team roster against Killamazoo. 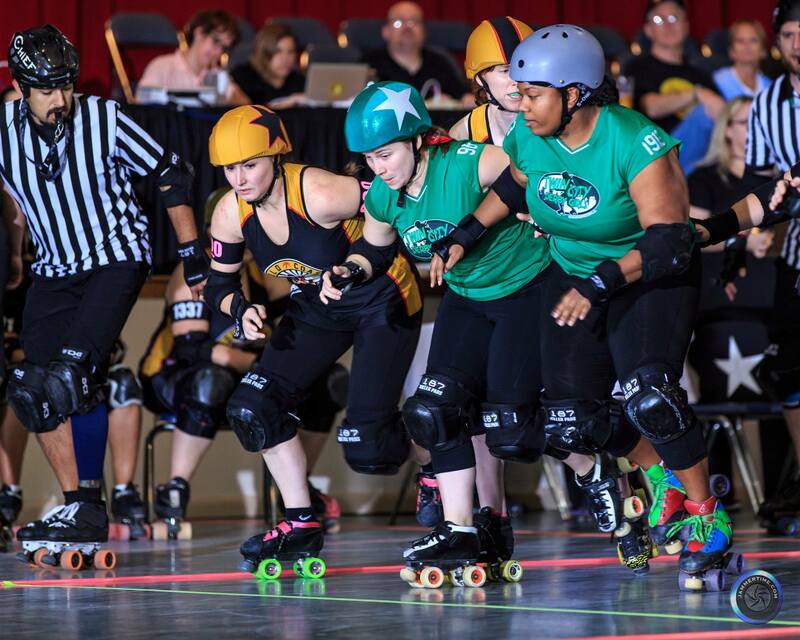 This past weekend, they traveled up to Hammond, IN to battle the South Shore Roller Girls. It was a tough one, but they fought HARD, putting up nearly twice as many points in the second half as they had in the first. The Alter Egos’ next bout is against the Peoria Push (at Peoria). Stay tuned to the Push’s Facebook page (or ours!) for information on times, location, and tickets! The 2015 travel season is underway! Last Friday, TCDG’s charter team headed down to southern Florida. While it was a long trip — the furthest that the team has ever traveled to play — it was a fabulous opportunity for TCDG to take on two strong and well-ranked opponents in one trip. On Saturday night, Twin City’s Evil Twins faced the 62nd-ranked Gold Coast in a fast-paced bout that saw some amazing work from all of the women in green. Particular shout-outs to MVP jammer SPECTRE and MVP blocker Mrs. T.
Gold Coast came out of the gate sprinting and kept the pressure on every moment throughout the first half, going into halftime with a sizeable lead. TCDG started the second half down by 51, but held Gold Coast to every single point. Final score was TCDG 96 to Gold Coast 148. #1913 Mrs. T. photo by jammertime.com. On Sunday morning, the Twins started bright and early down the road in North Lauderdale, against the visiting Fort Myers Derby Girls. It was a close chase throughout the morning, but Fort Myers kept their lead and took the win in the end. Final score was TCDG 143 to Fort Myers 191. Thanks to the Gold Coast Derby Girls for hosting us for both games. It takes a lot of volunteers to put on a roller derby bout, and we’re grateful to Gold Coast and their great crew for making this weekend happen! The team is still fundraising to help with costs for this trip If you would like to help us out, please visit our GoFundMe page and donate — any amount is greatly appreciated! 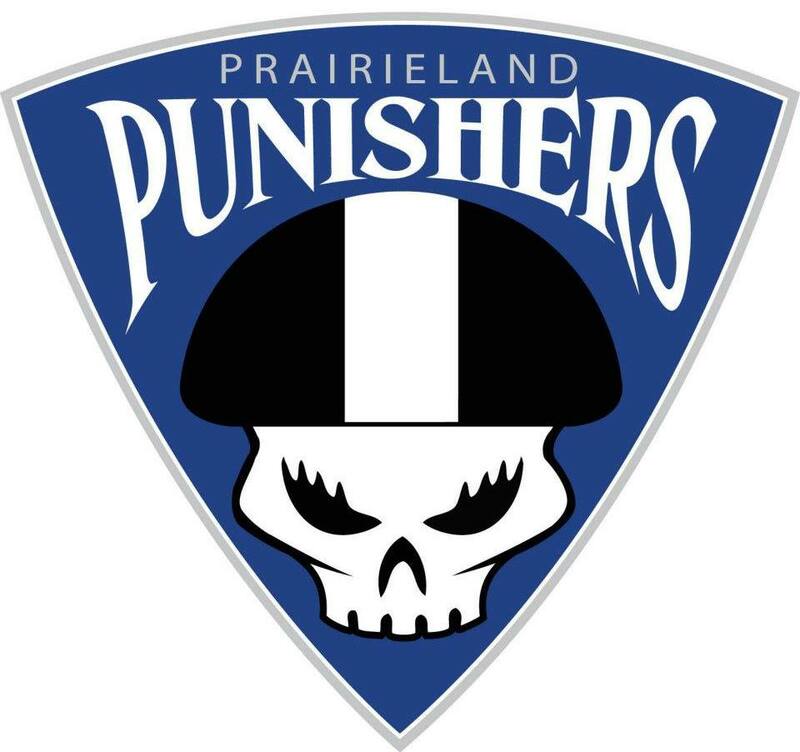 Next Up: The Dead Ringers take on the Prairieland Punishers 3/28 in Decatur, IL for their season home opener. No scoreboard wins on this first trip of the season, but 2015’s just getting started. TCDG’s C team, the Alter Egos, put 112 points on the board against the Killamazoo B team’s 212. Great work on the road against a seasoned B team, Alter Egos!!! 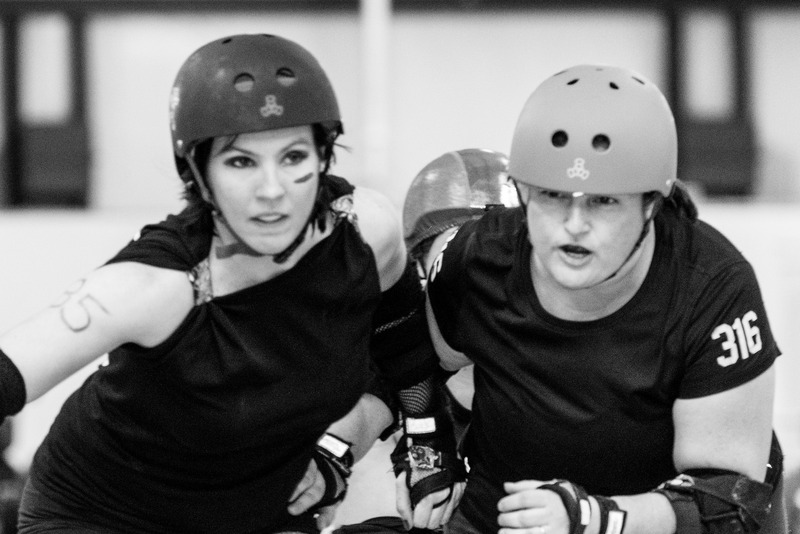 In WFTDA sanctioned play, TCDG’s 83rd-ranked A team, the Evil Twins lost to the 54th-ranked Kill Stars 74-215. All reports indicate a hard-fought bout that green can be very proud of, though; would you expect any less from TCDG? Next Up: The Evil Twins fly to Fort Lauderdale, Florida next weekend for bouts against Gold Coast (62nd) and Fort Myers (87th). You can help the team cover some of their travel costs by donating to their GoFundMe account! TCDG’s Alter Egos bring home the win in the season opener against the McLean County MissFits this past Sunday. The final score in this hard-fought bout was 131-129. 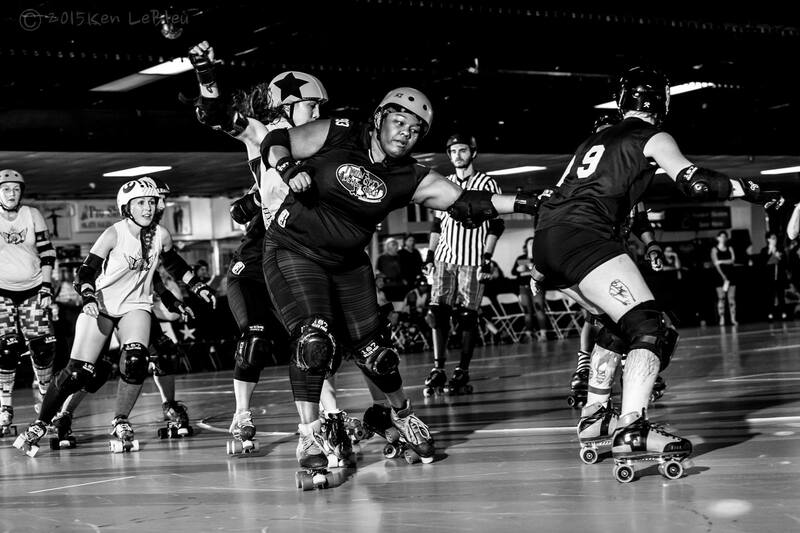 With our Feb. 8th season opener right around the corner, you can bet we’re aching with anticipation to strap our skates on, hit the track, and play some roller derby. During the off-season our jammers have been working on their agility and lighting-fast speed, while our blockers have been in the weight room and drilling defense. 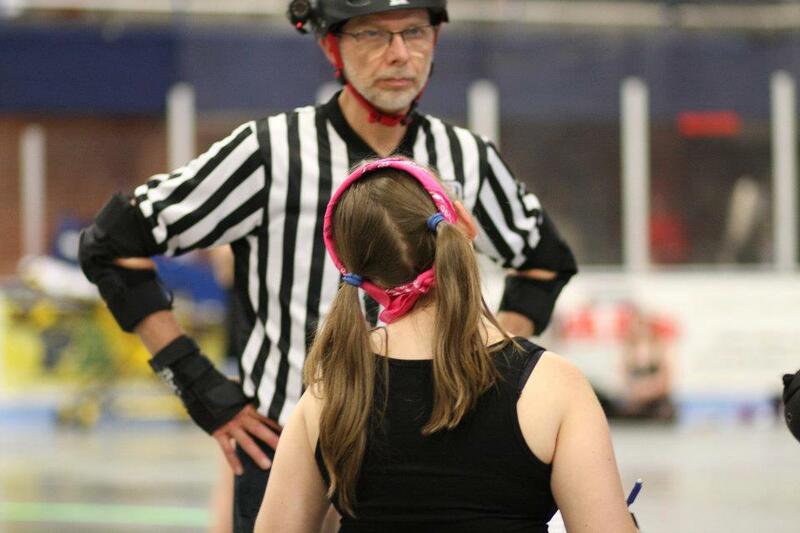 The 2015 season holds some very exciting changes for the Twin City Derby Girls organization. Our avid fans probably took notice last year that we transitioned away from our home teams (The ‘Paign, the Damagin’ Dames, and the Boneyard Bombshells). TCDG has reassessed, reorganized, and reunited. 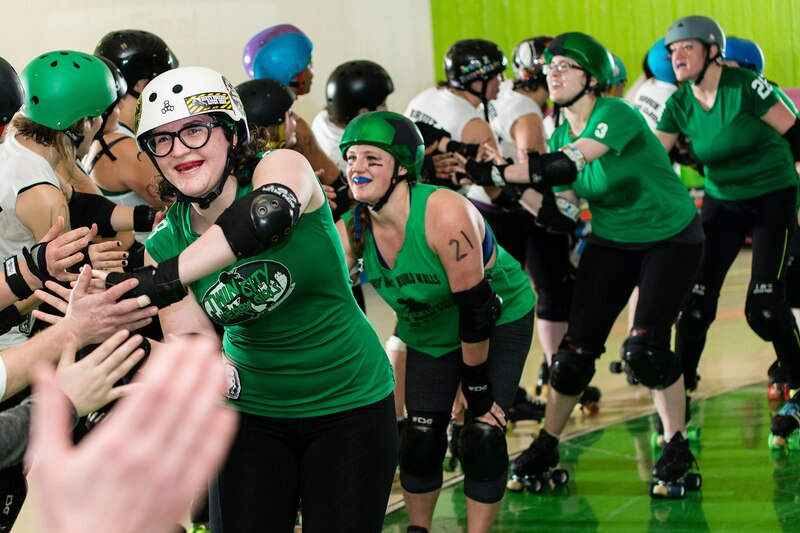 Three brand-new teams roll out for the 2015 season, skating under the beloved TCDG green and black. The Evil Twins are the WFTDA charter team, traveling throughout the country to compete for national rankings. The Dead Ringers, “B” team to the Evil Twins, accompany the charter team on their travels to compete against similarly-matched opponents. The Alter Egos hold things down on the home front, competing against teams within the local region. Skating under the same colors we represent one league, more unified and more powerful than ever. Beware, 2015 opponents. We’re a MEAN GREEN DERBY MACHINE. 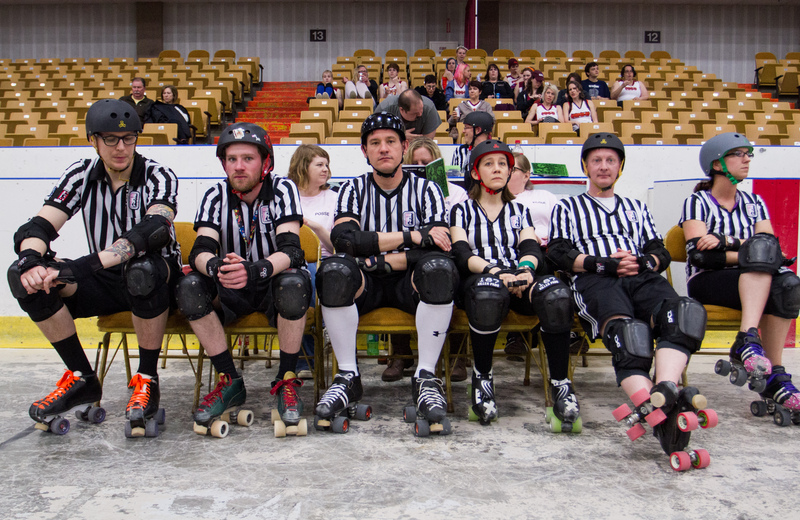 Twin City Derby Girls, your local roller derby league, is recruiting skating officials to serve as referees during scrimmages and to train for officiating during our home bouts. You don’t need to identify as a woman to be a ref! Being a referee requires solid skating skills (quads or inline are acceptable), endurance, and speed. Referees learn the rules, enforce penalties, and count points. Interested in learning more? Contact RefMalice@gmail.com. TCDG vs. Aurora 88s – WIN! TCDG won 209-206 in the final moments of their recent bout against the Aurora 88s, in one of the toughest battles we’ve ever seen at home. It’s not often that you see roller derby bouts going into overtime, but these teams kept everyone on the edge of their seats. Thanks so much to the 88s to returning to C-U and for being such fantastic opponents, and congratulations to our home team on the win!! Derby at home this weekend! Sunday, June 8, come to Skateland to see TCDG’s C team take on a mix of skaters from nearby leagues the Prairieland Punishers, MidState Mayhem, McLean County MissFits and Springfield! Tickets are $8 and on-sale now. Kids under 8 get in FREE! Make sure you’ve got a seat. Purchase tickets in advance at the link below or at the door until we’re sold out. We will have genuine TCDG merchandise, a bake sale with yummy snacks baked with love by our TCDG members, and we will have the ever popular Wheel Game. $1/wheel and you might just score some TCDG swag! Doors open at 6:00, and the action starts at 7:00. We’ll see you on the track.